Cheers to a season of love and bliss! The season of romance is here! If you are racking your brains on where to take your date as you count down to February 14th, then you’ve come to the right place. Our advice? Keep it simple! Nothing beats spending quality time with your special someone over a good meal. 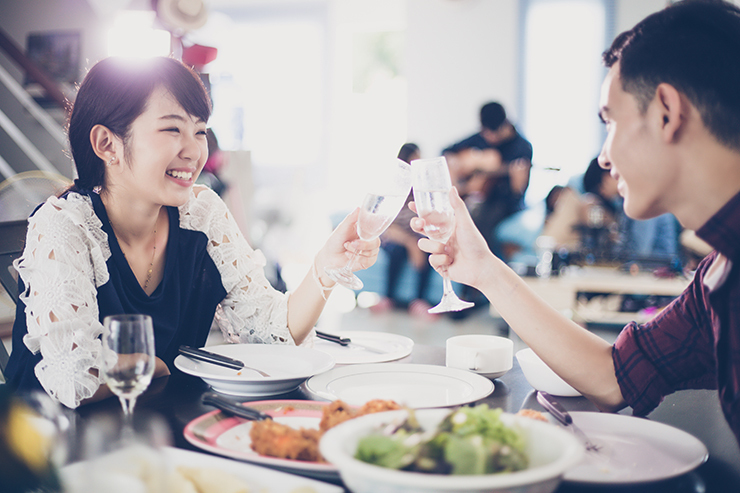 Being reliable wingmen that we are, we’ve got you covered with this list of restaurants where you can celebrate Valentine’s Day this year. Are you ready to bask in an evening of love and the delicious aromas of good food? 1.The Mast' of Mozzarella & Co. 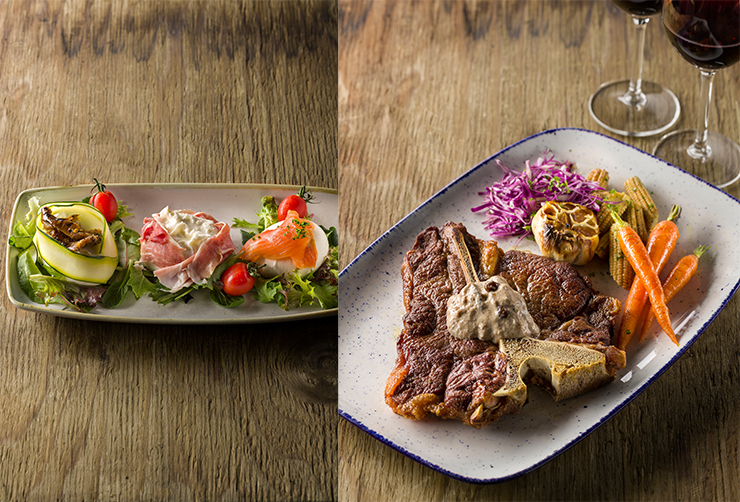 Besides freshly made cheese dishes like the Trio of Burrata (left), they’ve got other stellar items on the menu such as the Steak Florentine (right). If you and your partner love winding down over cheese and wine, here’s the perfect spot for a cheesy date (literally)! The Mast’ means “cheese master” in Southern Italian dialect – and it truly lives up to its name being the only establishment in Southeast Asia that makes their own fresh buffalo milk cheese straight from farm to table. While savouring incredibly fresh cheese, you can also watch the magic behind your meal through an open-concept kitchen. Watch how the pros stretch and shape mozzarella and burrata cheeses – it’ll make for great conversation too! 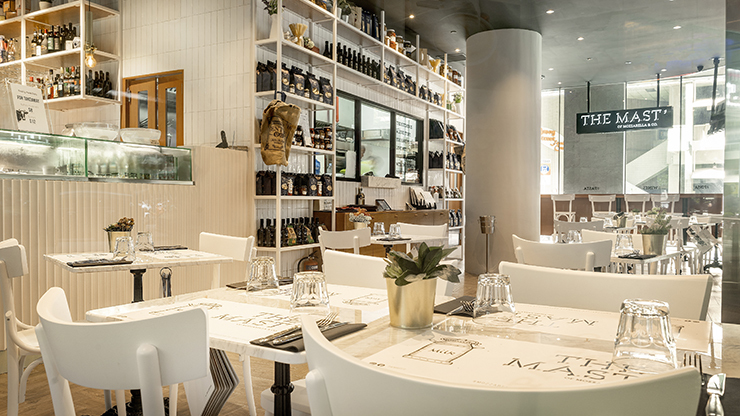 Fall in love with the restaurant’s rustic charm matched with a spacious interior washed in gentle shades of white. Located at the heart of the Central Business District in the newly opened Frasers Tower, we also love how convenient this is for an after-work date. Plus, here’s a cool fact: Having originated from Rome, The Mast’s outlet here is their first in Asia! Visit The Mast' of Mozzarella & Co. at Frasers Tower. With food this scrumptious, you’ll be scoring brownie points with your date by the end of the night. Planning a romantic stroll along the Singapore River? Stop by Robertson Walk for dinner and check out this cosy trattoria for authentic, home-cooked Tuscan cuisine. Be greeted by a rustic-style interior dressed with classic gingham tablecloths and warm lighting. Their offerings include hand-made pizzas and pastas made from special grade flour imported from Italy, and signature Tuscan dishes such as Rabbit Pappardelle (rabbit meat with wide ribbon pasta) and Bistecca Fiorentina (Florentine steak). And it’s no wonder this restaurant has been on Wine & Dine’s list of “Top Italian Restaurants in Singapore” for 3 consecutive years (2016 to 2018) – they offer an extensive selection of 70 wines. So, be sure to choose the best to go with their impeccable Italian fare! Visit Lucca’s Trattoria at Robertson Walk. It’s got all the snazzy vibes to impress your date! Can’t jet off to somewhere exotic this Valentine’s Day? You could still spend an evening in Cuba with your beloved, minus the hefty flight fee! Check out Cuba Libre Café & Bar’s latest outlet at Frasers Tower which offers more dining options than its other outlets. Soak in the sleek interior with eclectic quirks as you feast on contemporary Latin American cuisine with some of the best mojitos in Singapore. For this Valentine’s Day, their executive chef Alex has designed a special menu just for you. At $35++ per pax, enjoy a 4-course dinner with 1 complimentary alcoholic beverage of your choice. The Valentine’s Day menu will be available from 13 – 15 Feb 2019, 6pm onwards. 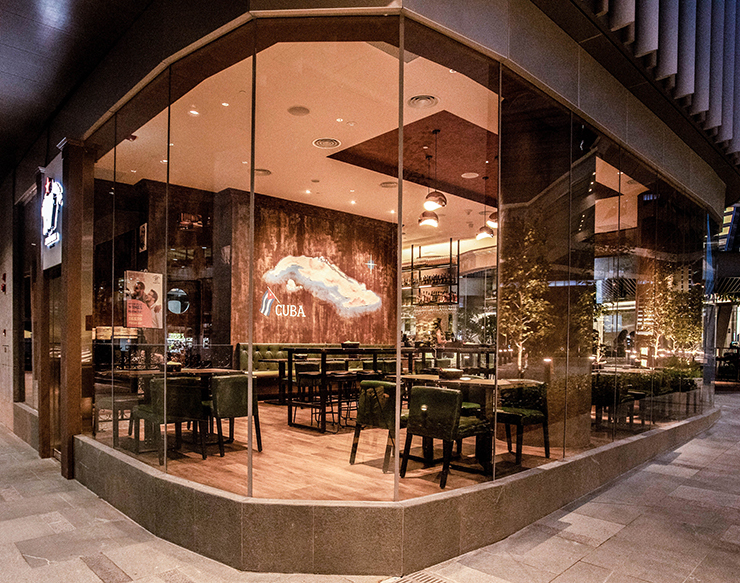 Visit Cuba Libre Café & Bar at Frasers Tower. This casual-dining Japanese restaurant is a hidden gem serving up exquisite Japanese fare at pocket-friendly prices. They pride themselves on being MSG-free as well as in using premium ingredients and condiments direct from Japan. Every dish is stellar in taste and presentation, right down to the details (shout-out to their adorable chopstick holders). Nestled in a cosy spot at The Centrepoint, get to enjoy a quiet, romantic evening with your partner. As a special treat only on 14 Feb 2019, receive three $10 vouchers* when you spend a min. of $60 (before service charge and GST) in a single receipt. *Each voucher can only be used for one visit with a min. spend of $60 (before service charge and GST) in a single receipt. 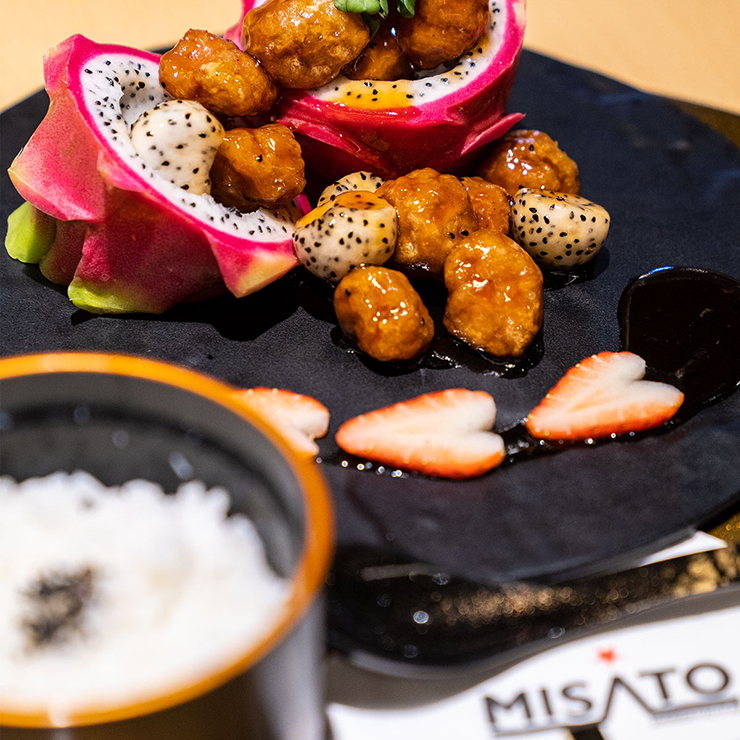 Visit Misato at The Centrepoint. Their well-stocked bar is definitely worth checking out! Tucked away in a cosy spot at Alexandra Technopark, Fuego Bar serves up quality Western fare at wallet-friendly prices. Just for Valentine’s Day, they’ve curated a 4-course menu which includes sparkling wine, at just $55 (nett) for 2. After dinner, enjoy the rest of the evening with your beloved at the bar – they’ve got a wide range of beers, interesting cocktails, whiskeys and more. Fuego Bar’s Valentine’s Day Menu is only available on 14 Feb 2019, at $55 (nett) for 2 pax. 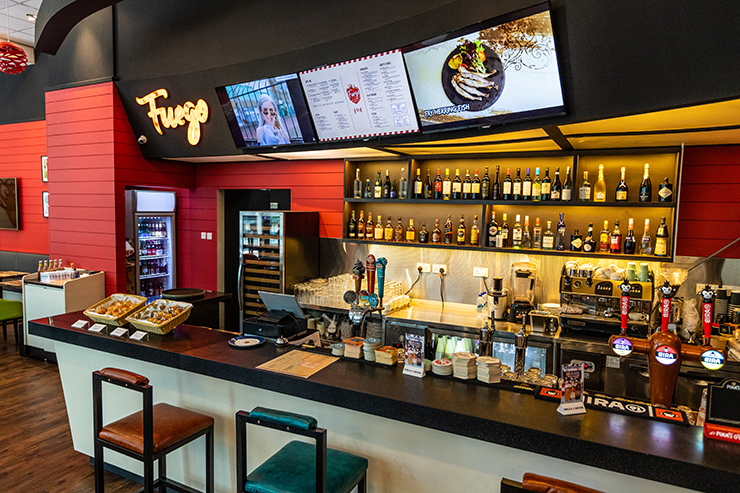 Visit Fuego Bar & Kitchen at Alexandra Technopark. For a quaint café date, check out BLVD at Changi City Point. You can start the night by catching a beautiful sunset at the mall’s landscaped rooftop garden. The view’s pretty spectacular so you’ll be all set for a night of romance! After the sun sets, make your way to BLVD, a swanky yet casual joint serving quality nosh. Savour hand stretched pizzas baked in a Beechwood Stone Hearth Oven, freshly made paninis, sumptuous stacked burgers and more. The restaurant’s emphasis on quality also extends to their drinks, with coffee produced from handpicked beans and premium Slayer X Coffee Machines, perfect if you and your partner are coffee aficionados. They’ve also got a Buy-3-Get-1-Free deal on regular pizzas from 4pm till closing time (11pm) – sounds like we’ve got a fun double date all sorted! Check out plenty of their other deals here. Visit BLVD at Changi City Point. Literally meaning “my home” in French, cuddle up with your beau in home away from home at the cottage-like Ma Maison. They serve a fusion of Japanese-Western cuisine including favourites such as omu rice, cuttlefish ink pasta and escargot. 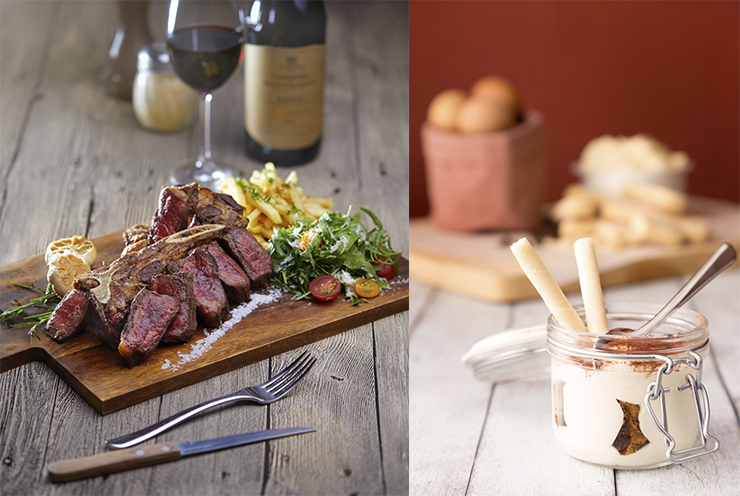 Ma Maison is also famous for maintaining a consistently high standard for its food and service. So, if you’re making a trip down this V’Day, be sure to make a reservation because they’re really popular! Visit Ma Maison at Anchorpoint. With that, we wish you a blissful and memorable Valentine’s Day. XOXO!